Dealer Ray Brandt says the body shop business, with about a 10 percent profit margin, is a hedge against declining profitability in the dealership business. In 1988, a young mechanic approached auto dealer Ray Brandt about converting a vacant building in a rough area near New Orleans into a body shop. It was a novel idea and a gamble for the retailer, given that collision repair is capital intensive. But Brandt's bet paid off. Over the past three decades, the venture mushroomed into a business with six locations and 140 employees in Louisiana and Mississippi and annual sales of $30 million. The original body shop has expanded to occupy a city block in suburban New Orleans and does $800,000 a month in sales. As for the young mechanic who pitched the idea: He's managing the business. Ray Brandt Auto Group, headquartered in Harvey, La., is a rarity. Fewer than a fourth of U.S. dealership groups also have body shops, according to the National Automobile Dealers Association. Many retailers are scared to enter the body shop business because it is capital intensive and highly competitive, said Brandt, a member of the Nissan National Dealer Advisory Board. Running a body shop involves investing in pricey buildings, expensive tooling and employee certification, he said. He spends $12,000 per technician every year on training. "You can't get certified if you're not up to date on all the equipment that you've got to have," he said. But Brandt relies on his multilocation, 18-brand dealership group to keep his body shops busy. 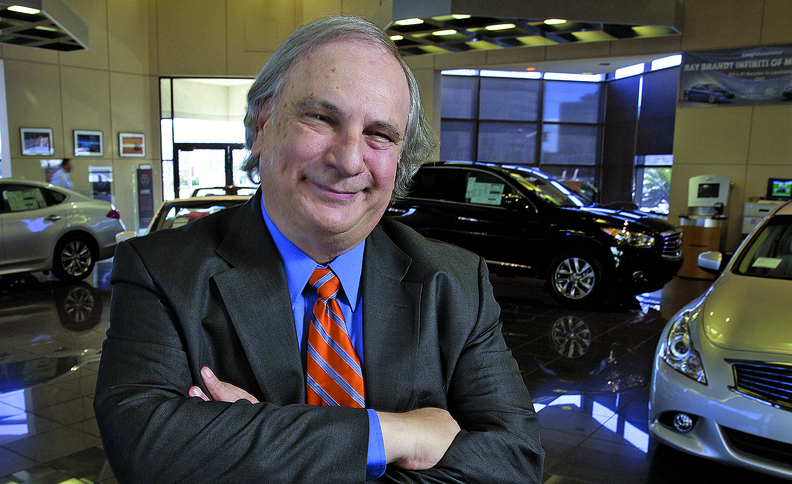 Ray Brandt Auto Group's franchises include Nissan, Toyota, Mercedes-Benz, Chevrolet and Hyundai. In 2018, the group sold 7,799 new and 5,696 used vehicles. "I don't have to do the marketing that I would normally have to do," he said. "We do better when we have dealerships in the area." That vertical integration helps protect profit margins. "My internal rate on fixing cars is cheaper than if I had to send them to a third party," Brandt said. "If I bought a used car that needed some bodywork, I can get it done quicker if I had my own body shop." Doing bodywork in-house also drives customer satisfaction, while the faster vehicle turnaround time means lower loaner fleet costs for the dealership. The body shop business, with about a 10 percent profit margin, is a hedge against declining profitability in the dealership business, Brandt said. "When you look at eroding profit margins in the new-car department, it is imperative that we focus on fixed operations, which includes parts, service and body shop," he said. "The fixed operation business is like your defense. If you've got a great defense, you're going to be in every game." Despite the economies of scale, Brandt faces challenges with body shops. The past year was tough because of competition, high certification costs and cost-conscious consumers forgoing fender bender repairs to pocket their insurance claim checks. To resolve insurance claims faster and reduce rental car expenses, insurance companies write the customer a check and move on, Brandt said. "Joe Blow doesn't fix the car. He just cashes the check," the dealer said. National body shop consolidators are also pressuring profit margins. "They are buying stores and they have more economies of scale," Brandt said. "They're very smart in managing their business and they are a fierce competitor." Despite the headwinds, Brandt's body shop business is growing about 10 percent annually. To meet demand, Brandt is considering adding a seventh location this year. Brandt scouts areas with high population growth that are underserved, preferably in cities where he also has dealerships. He said, "We look at opportunities every day."